Since the Christian speculation over the "four blood moons" lunar eclipses of 2014-2015 failed and neither the Great Tribulation nor the Rapture happened as predicted, we're still here. That means now we get to discuss similar speculation about the latest solar eclipse or celestial event. Are you ready? ...also brings you theories that either were dismissed with the arrival of Science or that are too obviously contrived to ever spread through other channels that cost money or by free channels that are limited to much-less-persuasive text (like the original Web 1.0). 2015, first flat-earther to write me: "I haven't seen you write about the flat Earth yet, which by the way, fits way better with bible teachings." 2016, same person after writing a flat Earth article for him: "Please cancel ALL emails to me. You are a complete moron and obviously have spent no time on researching the flat Earth." Likewise, because of YouTube, prophetic speculation is spreading about the latest interesting eclipse. It's even popular enough to break into mainstream news just like the 2014-2015 speculation did. I say "interesting" eclipse because there are several eclipses (lunar or solar) every year that are simply ignored by our helpful YouTube "watchmen." Unless a celestial event has something extra (like taking place on Jewish holy days or happening seven years away from something else interesting) then you won't see a prophecy video on it. Eclipses are far too common to form the basis of a prophecy theory every single time they happen. Claim: "The next total solar eclipse in America is in seven years and forms an X when combined with this eclipse. These eclipses could be marking out the seven year Tribulation!" Response: Where does the Bible say to look for eclipses to mark the Tribulation? Nowhere. What does it tell us to expect first? Jesus already said, "when you see the Abomination of Desolation" the Great Tribulation is next (Mt 24:15). Further, the seven-year-long 70th Week of Daniel cannot start this year as numerous prerequisites have not happened, like the Nuclear Middle East War, Elijah's coming, and most importantly the Good News of the Kingdom returning (Mt 24:14) (more on that below). 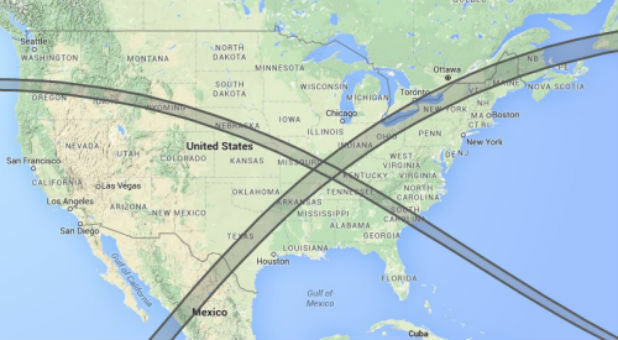 Claim: "The solar eclipse happens the day before the start of the Hebrew month of Elul." Response: "Day before" is kind of random and arbitrary. Wouldn't the eclipse need to happen on Elul 1 itself if you want to connect it to the past historical prophetic events of that day? That's what was done in 2014-2015 with eclipses on the very days of Passover and Sukkot by Mark Biltz. This time Mr. Biltz is happy enough with "the day before" to make a connection. This is a logical fallacy called "moving the goal posts." Claim: "Jonah left for Nineveh on the day of Elul 1 after there was a major solar eclipse in Nineveh the month before." Claim: "The solar eclipse is 40 days from Yom Kippur"
Response: Actually, it's 41 days before Yom Kippur because it comes the day before Elul 1 which itself always starts the "40 days of awe/repentance" before Yom Kippur, yes? But even if it was 40 days, so what? Elul 1 comes every year without event. Eclipses come every year without event. Nothing in Scripture connects general eclipses with prophecy. Claim: "World War 1 started in August, 1914 the same month there was a total solar eclipse over the Ottoman Empire (E. Europe) which ended with WW1." Response: Why is "same month" significant? As stated above, it's tenuous at best to connect an eclipse to any event that is not concurrent. Further, there have been half a dozen total solar eclipses in Europe since WW1, so why have we not had WW3-WW7 already? Because this WW1 eclipse claim comes from another logical fallacy called cherry-picking data. Claim: "The last time an eclipse crossed only the United States was during WW1 on August 21, 1914"
Response: I guess the implication here is that "trouble" is coming again this time? If this is how it works based on WW1, what happened to the total solar eclipse across the continent before WW2?? I guess there's not much of a pattern here when you include all the data but instead just draw a circle around the data that fits your theory, also called the Texas Sharpshooter fallacy. Claim: "The path of the solar eclipse passes over counties that 95% voted for Trump"
Claim: "The path of the solar eclipse passes over SEVEN towns called Salem!" There are many, many more claims than this about the eclipse because, just like with the 2012 Mayan Calendar speculation, as more people hear the idea, they perceive more connections of their own that spawn more YouTube videos. The above most frequently repeated claims are enough to see how arbitrary and subjective the "evidence" is for this eclipse being prophetically significant. Q: "What are the odds? It can't be just a coincidence!" A: No it's not a coincidence but the odds are not as great as you think when you understand what it really is! 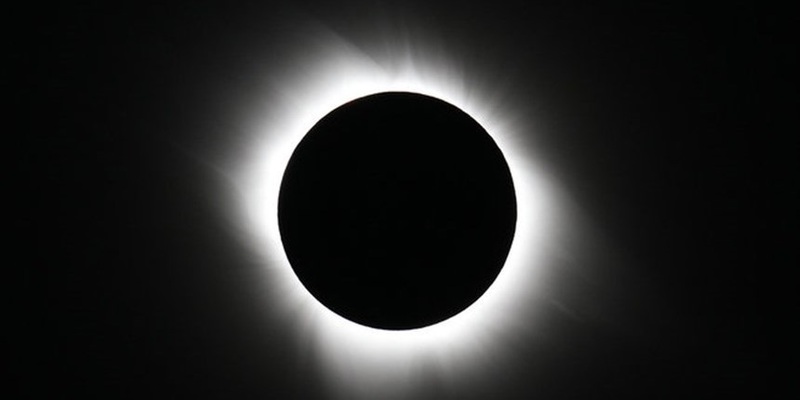 As the section above illustrated, the "connections" that are made to support the "significance" of the eclipse or other event use inconsistent rules. In other words, they use inconsistent rules and logic to connect whatever they can remember or imagine or Google that would impress people. If the event falls same day as a Biblical holy day...bingo! If it comes the day before a biblical date...close enough, bingo! If it comes the same month as something else big...bingo! If it comes seven years before something...bingo! Obviously, when you employ flexible, moving goalposts or "rules" like this, you are able to find interesting factoids for any event or date you believe is significant. This is what happened with the 2012 Mayan Calendar date, and the 2014-2015 Four Blood Moons theory and we know how these turned out despite the claim, "the odds of all these connections are astronomical! This happens not because of legitimate coincides but rather due to a human psychological bias called Confirmation Bias. This bias causes us to ignore or reject evidence against our theory and accept and report all the evidence for it. Even when people present evidence against our theory (like this article!) their bias will use flexible rules and other moving goalposts to reject the evidence against it. Joel 2:31-32 (ESV) — The sun shall be turned to darkness, and the moon to blood, before the great and awesome day of the LORD comes. 32 And it shall come to pass that everyone who calls on the name of the LORD shall be saved. For in Mount Zion and in JeruSALEM there shall be those who escape, as the LORD has said, and among the survivors shall be those whom the LORD calls. 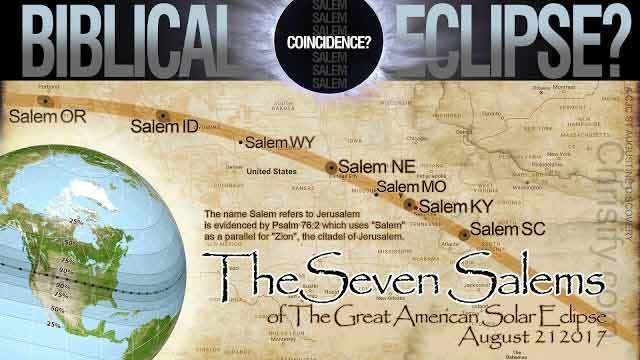 Look at that, will you, the word Salem is last part of the word Jerusalem and it's connected to an eclipse! "What are the odds?" The odds are very high indeed when you can "cheat" by matching any aspect of an eclipse to any part of any word in the Bible even remotely related to an eclipse. Contrivances like this only demonstrate the imagination and research genius of the prophecy theorist to justify their event as important. They don't provide any real Biblical proof that the event is prophetically significant. "The heavens declare the glory of God and the firmament showeth his handiwork. Day unto day uttereth speech, and night unto night sheweth knowledge. There is no speech nor language where their voice is not heard. Their line is gone out through all the Earth and their words to the end of world." When Jesus was born it was marked in the stars. The three wise men saw his star in the east and knew of it. What makes you think his second coming would be any different? Sounds reasonable, doesn't it? At least to most new to prophecy study. It's persuasive enough for many of them to hit the share button and send it to others to help warn them or ask their opinion. (I know for me I only ever watch a prophecy teaching on YouTube because someone shared it to ask my opinion of it.) The transcript above leads to a false conclusion to justify looking to the heavens for God's direction such as with eclipses. Psalm 19 tells us the heavens declare something, and it's a pretty broad concept at that: "God's glory." It uses a lot of poetic language (like anthropomorphism) to emphasize this. But there is no literal speech or language or communication on that level from the sky. There is enough expanse there for humanity to realize God exists and to be "without excuse" in denying this fact and disobeying him as Paul said (Rom 1:20). That's it for the normal, daily basis that the psalm is commenting on (with two rare exceptions, see 3 below). Because of this, the heavens cannot ever serve as a way for God to "speak" intelligibly to his children. For nearly all of us, space is just a random bunch of balls of light with different names, sizes and illumination levels. A few of these balls have vague or general historical meanings like the Signs of the Zodiac do. What it means when they light up or crisscross is anybody's guess, and guess away they do! This is why there are a million and one subjective opinions on "what the eclipse means" shared by prophecy theorists. The Bible already answers the question posed on how God has and will speak "to all his children" when the need comes to do that: through his end time prophet Elijah and lastly through seven literal thundering shouts of his voice (Ps 29:3=Rev 10:4) right before he brings his Kingdom to Earth at the 7th trumpet (Rev 11:15). Oh, God can speak to all his children at once with clear, human language when he wants to. He did this with all of ancient Israel at Mount Sinai and they consequently asked him to "please, stop" out of fear (Ex 20:19). As you can tell, apart from God's greatness, the heavens do not communicate much at all very clearly to us humans. This is why God uses several other much better means to talk to humanity. As noted above, all these means use actual, real, human language. If God spoke in a way any less clear than that, no one could be held accountable to act on his instructions or warnings. They could rightly claim they did not understand because his "heavenly lights language" was incomprehensible. But what about all those "sign" verses? Doesn't sign mean a message as with a "For Sale" "sign?" Doesn't God use the lights in the heavens to at least send simple informational warnings of end times events? Not quite. Let's look at the common verses that are used to justify drawing attention to eclipses and other heavenly displays. Genesis 1:14 (NIV2011) — And God said, "Let there be lights in the vault of the sky to separate the day from the night, and let them serve as signs to mark sacred times, and days and years." The thrust of Genesis 1:14 is that the heavenly lights would signal common divisions of time: "seasons, days and years." In the Bible, the month is based on the moon; months begin with the new (crescent) moon. Days begin when the sun sets or disappears. Stars in the sky change based on the season you are in. Years also can be marked by the solstices, or shortest or longest days of the year. That's what Genesis in context means by letting them be all things dealing with the calendar. It says nothing about "let them be for prophetic warning signs from God" like prophecy theorists wrongly wield (proof-text) the verse to mean. Luke 21:25 — There will be signs in the sun, moon and stars. On the Earth, nations will be in anguish and perplexity at the roaring and tossing of the sea. Revelation 12:1 (NIV2011) — A great sign appeared in heaven: a woman clothed with the sun, with the moon under her feet and a crown of twelve stars on her head. In both of these passages the word for sign could also be translated as "miracle," "token" or "wonder." Notice that none of those words convey the idea of "communication/speech/warning" as is portrayed by prophecy theorists. The point of the word is that there is a attention-catching display in the sky. It's called a "wonder" because it makes people "wonder" due to it being unclear and hard to explain. Further, if you read Luke 21:25 in context, you do not find instructions to look for this sign to mean anything. It comes at the end of God's wrath, right before the Jesus appears. It's certainly proper to have a nice heavenly fanfare before his triumphant return. By then we'll already know the day he's coming. Revelation 12 goes on to explain the meaning of the great signs of the Woman and the Dragon. The Dragon is the constellation Draco and also Satan. The Woman also works at many levels including the constellation Virgo, Mary and saints of Israel and of the Church. It shows plainly that the Woman gives birth to the Messiah who later is "taken up" to heaven (Acts 1:9=Rev 12:5). There is no connection in any way given between the Woman in heaven and the end times events. Later after she is found on the earth fleeing from the Dragon, she is indeed an end time character, too. The sign in the sky she portrayed earlier is never connected to her end time actions and existence. When people make such a connection they read into the text what is not there, ignoring what is there as they did connecting September 23, 2017 with Revelation 12. As the previous section explained, when you look at the "signs" verses in context, they do not support the meaning for which they are used by Christian prophecy inventors. Each verse refers to a specific instance and application, such as calendar signs and the the sign on the day Jesus returns. They are not meant to give "carte blanche" or a blank check to justify "scanning the heavens for any sign" like Christian theorists do. All that was obvious to me long ago and I have written on it before. Thinking deeper on this topic, I began I see another problem. The meaning of the word translated "sign" in our English Bible versions does not support the definition that prophecy theorists use it for. Sign, like many words, has several valid, possible literal meanings and connotations. A sign can have a short message in it like a billboard or "For Sale" sign does ("$1000 call 555-1212"). Or a sign can mean something as limited as a signal light to indicate your engine is malfunctioning or that the day is over like a sunset does. Prophecy Theorists: Sign = "communication or message from God" much like a "billboard" or "God's day timer" (to borrow from the title of Mark Biltz's book where he teaches watching for heavenly signs on God's calendar among other things). The Bible: Sign = "wonder, display, token, signal" again, much like a sunset or a car's dashboard engine warning light. Here's what the problem is with prophecy theorists' portrayal of celestial "signs" with their limited and specific meanings in their context: It's like when our car's designated engine warning light goes off and we decide it means we need to call our mom because she misses us. In other words, we reject the simple, limited, contextual meaning of the sign and expand it to be not just something else from left field, but a complete communication like "Aww... Mom misses me. I need to call her." Meanwhile, all the engine light indicates is something quite vague and limited: something is wrong with the engine! A Real End Time "Sign:" "Good News of the Kingdom"
Matthew 24:14 (ESV) — And this gospel of the kingdom will be proclaimed throughout the whole world as a testimony to all nations, and then the end will come. "This" gospel of the Kingdom? "Which one was that again?" Exactly! Until 2016 I did not know the answer to that, either. It had me stumped, too. It's not our fault. Christianity does not teach any such "this gospel of the Kingdom" or we would not respond with blank stares when asking what it is. Christianity certainly teaches "good news about Jesus" just not the good news of Jesus, you know, the one that he taught on the rewards God gives people now who seek the coming Kingdom and God's righteousness (Mt 6:33). Going further, if Christianity did teach the Good News of Jesus already, Jesus could not indicate it as an end time sign. We'd somehow have to know exactly when it reaches "all nations," which one can never know for sure or easily. But if the Good News message of the Kingdom died out with Jesus and the apostles, then when it reappears on the Earth in our time, we then have a distinct clear and recognizable, unprecedented-in-2000-years sign. It will be so amazing that the worldwide spread of it in this social media/YouTube age is ensured. You won't be able to miss it. If you want to understand this important topic fully now, see the study in my supporters section. Finally, Here's The Real Role of Eclipses In End Time Prophecy! By the way, the Good News of the Kingdom message will contain a built-in extra reason to "obey it" (2Th 1:8). I'm referring to the warning on end time events. In our time, you don't just need to repent to be saved, but also to follow God's end time escape instructions to survive what's coming. Joel 2:31 (ESV) — The sun shall be turned to darkness, and the moon to blood, before the great and awesome day of the LORD comes. Revelation 6:12-14 (ESV) — 12 When he opened the sixth seal, I looked, and behold, there was a great earthquake, and the sun became black as sackcloth, the full moon became like blood, 13 and the stars of the sky fell to the Earth as the fig tree sheds its winter fruit when shaken by a gale. 14 The sky vanished like a scroll that is being rolled up, and every mountain and island was removed from its place. However exactly it happens, such a new foreign body is identified by Revelation later (and only after analyzing it's many literal clues) as a dwarf planet it calls Wormwood (Rev 8:10-11; Note that the Greek word aster translated "star" is not specific to a star but can mean among other things planets of various sizes). Notice also in context that even this unprecedented combination lunar and solar eclipse does not happen as an isolated incident. A great earthquake, so great that it shifts the Earth's entire topography significantly, also occurs with it. Not to mention so many shooting stars that the normal starry night sky scrolls away. How is this possible? The dwarf planet Wormwood is broken up at Earth's Roche Limit and partially disintegrates. It can then literally "fall from heaven" upon the Earth (Rev 8:10). It's dispersed slowly enough in small enough chunks to not end all life on Earth right then and there. Now is it a "sign?" Revelation does not use that word but again, in the many meaning of the word sign, you could say among the first "signs" of Wormwood is a unique double eclipse. But we'll already know it's coming because of Elijah (and already be in safety in Judea as Psalm 91 depicts). So in one way it is but the way theorists look to eclipses to tell them the end ahead of time, it's definitely not. Seeing this all in context, can you understand how incorrect it is for prophecy theorists to quote those verses above to support their attention to isolated eclipses (even if four similar ones happen in a row) like they did in 2014-2015? Can you understand how it's the same as seeing the dashboard engine indicator light go on, ignoring its "check engine"-label context and deciding it means something completely different outside the car? 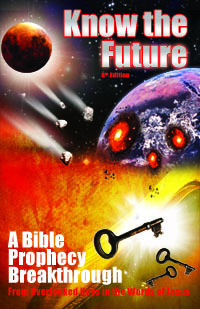 If you feel like you're done with YouTube prophecy videos and ready to understand end time prophecy literally, comprehensively and in context, including all the details on Wormwood (3rd trumpet) and the rest of the seven seals, seven trumpets and seven bowls, order my book Know the Future and begin reading (the bonus eBook version) instantly while the softcover version makes its way to you printed and shipped by Amazon's CreateSpace in South Carolina. You'll be directly blessing yourself and others by supporting my further writing on this site. Thank you. Hi Tim. I’ve read your book twice now and thank you for sharing your insights. Are you familiar with Neville Goddard? His books made me rethink the whole meaning of the Bible. What if the gospel of the kingdom is: we create our own reality/circumstances through our beliefs? That is, a belief with absolutely no doubts or contradictory thoughts. If the Illuminati exists and has been in control for thousands of years, I thought to myself, what if they created the Bible to control events? If people believe it then it will come true. If you believe you are poor, you will stay poor. Neville says to deny the evidence of your senses and so much more. Anyway, just thought you would be interested. His books are all free online. Thanks for the eclipse article. Really cleared things up for me. Debra, we do reap what we sow “create our reality”, but the Gospel of the Kingdom is about God creating a better reality for those who seek his righteousness/kingdom first (Mt 6:33). Please take me off your distribution list. The gospel you are teaching doesn’t agree with Paul’s gospel definition. John, Paul in 1Cor 15 never defined the Gospel of the Kingdom nor even the whole gospel. He was focused on the good news of the resurrection that the Corinthians were doubting (1Co 15:12). That’s why that’s now the go-to resurrection chapter. Also, why are you prioritizing Paul’s version of the Gospel over Jesus’ in the Sermon on the Mount (Mt 5-7)? Is it preposterous to postulate that the 2017 eclipse is a sign of the end season like some constellations are often a sign of the end of winter or how some stars are only visible during certain times of year? It seams to me that that is what this is, there are simply to many ‘coincidences’ for this an the next one seven years later to not mean something. I see this as a special road sing that tends to show up in my area, it usually reads “speed limit 30 ahead.” It tells me that another sing is near and gets me to pay attention to what is going on a little more. Your analysis about the sun being black as sackcloth and the moon being blood red…. being caused by another heavenly object causing an eclipse is possible which would cause the other planetary distresses, but I think the blood moon would be caused by dust in the atmosphere as red sunsets. For the moon to be seen it would have to be getting light from somewhere as it does not have any of its own. The Joel Revelation passages , using your method of interpretation, of the literal first, says there was a great earthquake, then sun dark and moon red, dust from GREAT earthquake. Stars falling to earth could be earthly projectiles returning from GREAT earthquake, or maybe volcano. Does Bible ever mention volcano and could it be part of earthquake. I love your book. I have read others and agree with most of what you have written. I especially like the analysis you use and have adopted it as my own. My dad used to say it was better to walk off a cliff than to follow someone off a cliff. Think for yourself, don’t blindly follow. Bob, Sounds like you have been listening to Michael Rood regarding red moon from atmosphere. =) I don’t know if it’s possible for the moon to turn red because of atmospheric conditions like he claims. It’s never happened, but who knows? I can’t say 100%. At the same time, lunar eclipses only happen at full moons, and oddly enough it mentions the “full moon” becomes red… unrelated or is it directing us to think of a normal lunar eclipse event caused by the earth blocking the sun? These are events that are related to the beginning of the Day of the Lord and to my mind will not occur until near the end of the tribulation period, sometime during the last half, when the wrath of God falls on an unrepentant world. As this is being written there are more smelly events taking place in Boston where the hand of George Soros and other unregenerate lefties is on display for all to see. Hang on, both the worst and the best are yet to come. well, that video is from YouTube and there is a lot of false things on YouTube. However your description sounds very interesting and i might be inclined to check it out. plus, claiming to know “all truth” sounds like loony. only our lord and savior Jesus Christ can REALLY know all truth. another thing is a lot people claim this is the first time that this has ever happened, based on what Ive heard this is not the first time. but that’s as far as i know. Huh. Tim, I may disagree with you on religious matters, but you have to be the most rational fundamentalist loon I have ever seen, and I mean that as nicely as I possibly can. At any rate, I sincerely thank you for your work here; I have some, shall we say, fervently religious acquaintances who were in absolute hysterics over the eclipse and the Virgo thing, and all my attempts to reassure them that these were merely the mundane results of the moon and planets going through the motions fell on deaf ears because I was using scientific articles on the relevant subjects. But you spoke their language far better than I ever could. My husband had by-pass surgery this week so for me the eclipse has been eclipsed by other concerns (he’s doing well). I went to a church Sunday looking for some comfort and did enjoy the service and found it interesting. They talked a lot about the eclipse. This was the first time I’d heard all the buzz words like Elul, Yom Kippur, WWI and the eclipse passing over the US as a sign. As they spoke I tried to connect the dots of this enthusiastic tale and apply it to scripture but it just wasn’t matching up. I didn’t get it, but I did give them credit for the enormous amount of studying I thought they must have done to come up with all of that. That afternoon I sat down to read Tim’s latest article that I had printed off earlier sometime and was surprised to see that it was about the eclipse. I was eager to read it and knew with confidence that I was going to learn what was really going on. I did not know that all of this had been on the internet and was spreading like wildfire. I almost laughed out loud at myself for thinking they had come up with all this on their own. Come to think of it, they didn’t explain how they knew it and acted a little exclusive in their knowledge. But all my questions were answered in Tim’s article. Everything! He brings a smile to my face with his humor. He is at the top of my “go to list”. God is using him to help keep us out of the weeds and from being misled. Thank you Tim. I am not sure what day, hour, or year Jesus is coming. I take nothing what anyone says except what the scriptures say. I do find the research here a good source of study. What I find from a lot of people talking about the rapture is they believe they are right and leave no room that scripture could be saying something different. They come across angry There are a lot of nuts on you tube but there a lot of nuts that have websites too. I do not know if the rapture is 2017 or 2026. It doesn’t matter exactly when but only to know it may be soon. It very well could be 2026 and would be proud to look to this time but I am prepared for now. I read Luke 21:25 and I can’t think of a better time this could apply to us now this day. Love all of you in Christ !!!!!! !